1st Rubens Barrichello (Brawn GP), 1h16m21.706s; 2nd Jenson Button (Brawn GP), 1h16m24.572s; 3rd Kimi Raikkonen (Ferrari), 1h16m52.370s. Q: Kimi, it was a bit of a repeat for you of the Belgian Grand Prix in many ways with the Force India in your mirrors just about throughout the whole race. Kimi Raikkonen: I got a very good start but them something happened with Lewis. He slowed down but I had nowhere to go and I had to go around the left half on the grass, but I needed to back off before then. If I had had some space to go around him I would have got him at the start. Anyhow, it didn't really change the end of the race. In the end he went off. We got third place a little bit on a gift but it doesn’t matter. It all counts. Good points for us. It is a bit disappointing to drive as well as you can every lap, not really making any mistakes, and still finish quite far away from the first two. It is not the perfect position for me or for the team, but at least we scored some points which we needed. I think we got the most out of the car this weekend. It is good for the fans to be on the podium. It is much better than finishing fourth. We are going to keep pushing as hard as we can. We know that there are cars quicker than us, but maybe some races we can still challenge them for the win and that is what we try to do. It was a great thing for the team and everything worked well for us and the guys put in good hard work. Q: It looked like a small glitch at the second pit stop and you just caught the leg of the refuelling guy. Then you had to brake before you left the pit lane. KR: I was in a hurry to get out as I knew it was going to be very close. The lollipop guy just moved a little bit and I was ready to go and he put it back down and I stopped. But luckily enough the fuel rig was out and I could go. We lost a little bit of time but not too much. It would not have been enough anyhow for beating McLaren at the pit stops, but we could keep the Force India behind and in the end it did not make much difference. Q: Kimi, how much pressure was Adrian (Sutil) putting on you, or were you just able to push the button and get yourself a safety margin? KR: I think it was very similar to the last race with (Giancarlo) Fisichella. OK, sometimes it looks as if it gets very close in the middle of a chicane, but then once you get to the corner exit and you start accelerating and he’s still in the chicane it opens up again, so it never really got very close, so that I would need to defend or anything like that. They seem to be fast in a straight line, fast through the corners, so for sure I needed to make sure that I didn’t make a mistake and I got a good run in the few places on the circuit where I knew that his only chance was going to be. So as long as I didn’t make a mistake in those two places it was OK.
Q: Do you regret the strategy that you chose, the two-stop? KR: No. I think we still did the right thing. We got the best out of the car. We know that we’re where the top cars are, we’re not as fast. The car feels more or less OK, we’re just missing grip, we’re sliding more than the others and that’s the penalty that we have to pay. We’re not going to have any more new parts for the car, so it is what it is right now. Third place for us is very good, we’re still keeping position in the championship which is what we’re aiming for. I think we got the maximum out of the car. Q: Much difference between the tyres? KR: I think the soft one was easier for us. It is normally. It’s hard to get the hard one working. Probably we don’t have as much downforce as the others, so you cannot put load on the tyres, you cannot get them working. In the end they started to work a little bit better again and it helped but for sure, the soft one is the better one. Q: Will Singapore suit you better? KR: It should be a bit more than Valencia, Monaco. Hopefully there we will have a bit more of a chance to challenge for first place but I don’t know. We will wait and see. Hopefully we can be stronger there. 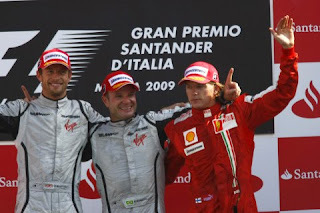 Q: (Heikki Kulta –Turun Sanomat) Kimi, you have had four successive podiums. Are you surprised by this consistent record? KR: A little bit, yes. But we’ve been chasing the car a bit since the last five races and it’s been working well for us, we’ve been getting the best out of it and other people have got the most out of their cars and their package, so it has worked out very well for us. It’s a big surprise to finish on the podium, but OK, here we were a bit lucky to finish on the podium. No matter how it comes you need to finish the race, so we will try again in the next races and try to keep third place in the Constructors’ championship.